What processes, technologies, and strategies are these best in class organizations adopting? 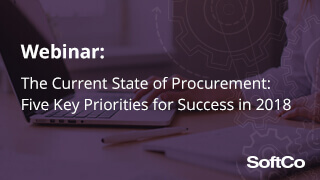 In this webinar, Garret Pearse and Michael Cullen of SoftCo discuss the current state of procurement and trends that you will need to master to ensure success in 2018. 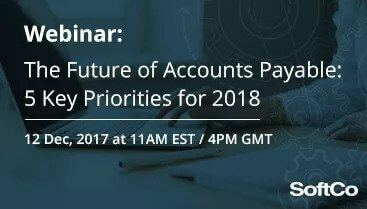 In this webinar, Garret Pearse and Michael Cullen of SoftCo discuss the current state of the accounts payable landscape and trends that you will need to master to ensure success in 2018. 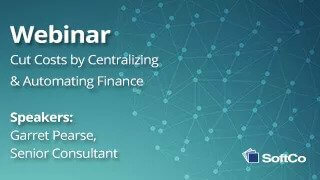 Are you struggling to control spend in your business? 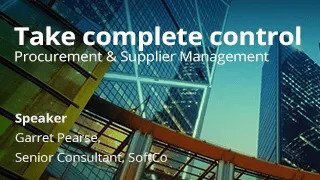 Too many unapproved suppliers, inadequate budget controls and poor segregation of duties? Does your organization have multiple suppliers for the same goods and services, failing to benefit from supplier discounts and suffering from an overall lack of visibility over spend? If this sounds familiar, it’s time to take back control!